Filter design mostly bases on a limited set of widely used transfer functions. Optimization methods allow to design other types of filters, but the functions listed here have been studied extensively, and designs for these filters (including circuit designs to implement them) are readily available. The filter functions presented here are of lowpass type, and transformation methods allow to obtain other common filter types such as highpass, bandpass or bandstop. It should be noted that whilst the amplitude response is very smooth, the step response shows noticeable overshoots. They are due to the phase response which is not linear or, in other words, to the group delay which is not constant. The amplitude response plot shows that the slope is 20n dB/decade, where n is the filter order. This is the general case for all-pole lowpass filters. Zeros in the transfer function can accentuate the slope close to their frequency, thus masking this general rule for zero-pole lowpass filters. , which corresponds to approximatively -3 db. This -3 db reference is often used to specify the cutoff frequency of other kinds of filters. Butterworth filters don't have a particularly steep drop-off but, together with Chebyshev type I filters, they are of all-pole kind. This particularity results in reduced hardware (or software, depending on the implementation method), which means that for a similar complexity, higher order Butterworth filters can be implemented, compared to functions with a steeper drop-off such as elliptic filters. With this, the denominator ploynom is found from the values of the poles. In comparison to Butterworth filters, Chebyshev filters have a supplemental parameter: a ripple in amplitude. This ripple, which could be considered as non ideal, has the tremendous advantage to allow a steeper roll-off between passband and stopband. The ripple can happen in the passband, which is the case for Type I Chebyshev filters, or in the stopband for Type II filters. for an input in the range −1 < x < 1 and then rapidly grow outside this range. This characteristic is a good prerequisite for devising transfer functions with limited oscillations in a given frequency range and steep roll-offs at its borders. but continues to drop into the stop band as the frequency increases. This behavior is shown in the diagram on the right. 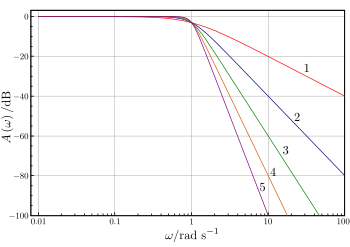 The common practice of defining the cutoff frequency at −3 dB is usually not applied to Chebyshev filters; instead the cutoff is taken as the point at which the gain falls to the value of the ripple for the final time. Also known as inverse Chebyshev, this filter function is less common because it does not roll-off as fast as type I, and requires more components. Indeed, the transfer function exhibits not only poles but also zeros. Elliptic filters, also called Cauer filters, suffer from a ripple effect like Chebyshev filters. 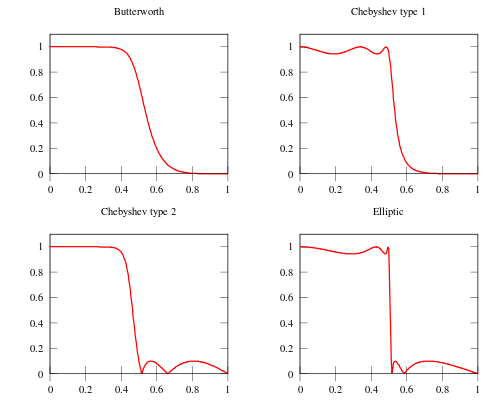 However, unlike the type 1 and Type 2 Chebyshev filters, Elliptic filters have ripples in both the passband and the stopband. To counteract this limitation, Elliptic filters have a very aggressive rolloff, which often more than makes up for the ripples. The following image shows a comparison between 5th order Butterworth, Chebyshev and elliptic filter amplitude responses. Using what we've learned so far about filters, this chapter will discuss filter design, and will show how to make decisions as to the type of filter (Butterworth, Chebyshev, Elliptic), and will help to show how to set parameters to achieve a set of specifications.